If you are interested in acquiring a survival knife there are several factors to consider when determining which knife is ideally suited to meet your unique needs. There are a great deal of brands, styles, and features out there and in this article we will help you assess both your needs and what type of knife will best address these requirements. Before deciding where you want to buy your survival knife or which brand you want it is important to understand what qualities make a knife a “Survival Knife”. 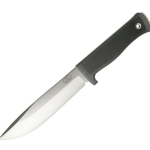 Most knives for a survival situation are fixed blade and larger than an every day carry (EDC) knife. Usually with a 5 inch blade at minimum. 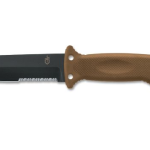 This is because it is assumed by knife makers that if you are looking for a knife as a tool in a survival scenario, you will want one that is heftier and more robust to stand up to cutting, chopping, prying, and bashing as needed. They are not making a knife for cutting cheese or trimming your nails. Survival knives are made to be used as a tool, not a utensil. Additionally, survival knives typically have special features that are aimed at increasing your odds of survival if you are out on your own. This may mean having a hollow handle full of navigation, fishing, or first aid gear, heavy serrations to enable cutting of branches and rope, or a glass breaker for smashing safety glass, to name a few options. 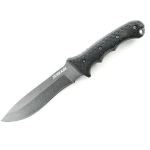 These features vary greatly in their utility and are added to knives that are intended to be used in different survival situations. What Survival Environment Are You Buying a Knife For? It is vital to consider what type of survival scenario you are likely to face with your survival knife. Do you live in a big city? Do you live in a rural area? Do you live near water? Where you will be surviving is important to consider because it enables you to find a knife that is ideally suited to take advantage of YOUR environment. You want a knife that meets your specific needs rather than a middle of the road knife that has features you will never need and is lacking ones that would be useful. Consider these options and how you would use them to survive in your environment. Having the right tool for the job will go a long way towards increasing your odds of survival when the time comes. How do you want to carry your survival knife? Most people will focus their search for the perfect survival knife on the knife itself and will unwittingly settle for a less than average sheath to carry it around in. In practice, your sheath is as important a part of your kit as the knife itself. Having a good sheath pays dividends when out in the elements as it will allow you to protect your blade and carry it in an accessible location in comfort. Additionally, a quality sheath will last a lifetime and you will not have to worry about seams coming apart or a strap breaking when you need your knife most. A sharpening stone – this will keep your edge razor sharp no matter where you find yourself. Never worry about mangling a skinning job if you can hone your blade on the go. A compass – this will help you find your way when surviving. A small compass integrated into your sheath will save weight in your survival kit and turn your survival knife into a space-saving multi purpose tool. Fire starter – will help you start a cooking fire without matches in rain or wind. A major upgrade over carrying a dry container around for matches. Paracord – paracord is like duct tape in that it has countless uses. Having a bit of it around with you can come in handy when you find yourself in a difficult situation. 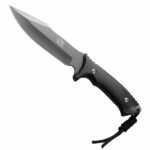 As you can see there are a lot of great options to consider when finding the best survival knife for your survival situation. When looking be sure to consider what factors you will be up against when surviving in your area. 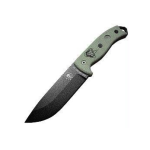 Buy the best knife that you can to fit your needs and save a little of your budget to pick up a quality sheath if your choice of knife does not come with one. Once you have your ideal survival knife you will have an important tool in your survival arsenal or bug out bag essentials.